A man is now homeless after his 20-by-14-foot timber house and belongings in the Neal Pen Road Extension area were completely destroyed by fire about 10:00 this morning. Nothing was saved .The estimated loss is about $30,000. The homeowner, Cornel Gomez, 25, said that he was away at the time, cutting a yard. He said that he had left home about 9:30, but shortly after, at about 10:00, he heard a loud explosion, then saw smoke and fire. Gomez did not think that it was his property, and after finishing his job, he started for home. He then met some of his neighbors, who told him that his house had burned down. Gomez said that he rushed home, only to find that indeed, it had been completely destroyed by fire. He told Amandala that he was baffled as to how his house could have caught fire. Neighbors told Amandala that the fire engine responded to reports of the fire, but the firemen did not have access to the burning house because it was a distance away, and there was no road after Pen Road ends, and only a little “picado” road which could not enable vehicle access, and that “London bridges” are used to go into the area..
Gomez said that he was informed that his girlfriend went to the house, and shortly after she left, there was an explosion, and the house erupted into flames. He is now homeless and must now struggle to rebuild again. Gomez said that he is seeking public assistance, such as materials with which to rebuild his house, and financial support to buy much-needed items, including food and clothes. He can be contacted at phone numbers 663-8398 or 621-7746. 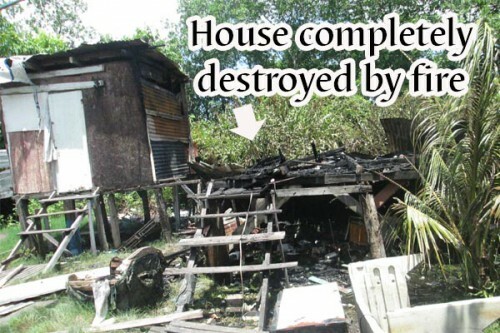 Gomez said that the fact that his house burned completely because the fire engine could not access the area due to lack of road access points to the urgent need for roads to be built in the area, so that another fire does not destroy another home. Gomez especially called on the area representative, Hon. Anthony “Boots” Martinez, to “step up” and construct the much-needed road.